Skinny Army Green Trousers by Younger. It only takes one look to fall in love with these skinny army green trousers. Featuring a trendy skinny fit with subtle ruching along sides. Constructed with front and back pockets, zipper and button fly, and belt loops. Skinny army green trousers designed with silver asymmetric zipper accents. Fabric includes slight stretch for a slim fit with comfort. The perfect match with any military-inspired menswear. Go army chic in these skinny army green trousers great for any day-to-night look. 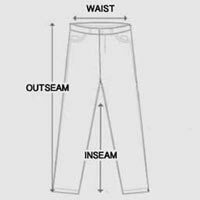 These are comfortable slim fit and true to size. It really is tight around legs and thighs.